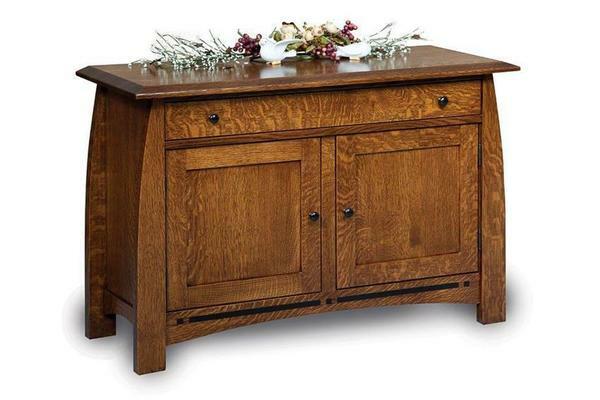 Our Amish Boulder Creek Enclosed Sofa Table comes to you from the beautiful Middlebury Furniture Collection. Its exceptional construction will bring both beauty and grace to the living room. Your favorite photos and items of decor will look excellent atop its smooth surface. A spacious cabinet area will help you keep clutter at bay. The Boulder Creek's full extension drawers are a convenient way to keep your essentials handy. Extra remotes, board games, and any other miscellaneous items fit perfectly here. We love the simple look of the hardware that is pictured. However, there are many other options to choose from in order for you to create the sofa table of your dreams. You are sure to be able to find what you are looking for in our wide variety of 100% solid hardwood options. Each choice is handpicked and sourced from right here in the United States, ensuring only the best quality. Top the wood of your choice off with your stain selection for a truly one-of-a-kind sofa table. Looking for perfect pairings? The Amish Boulder Creek Closed Coffee Table and Amish Boulder Creek Hutch Entertainment Center will help you create the warm, cohesive living room you have always dreamed of. Should you encounter any questions or concerns, please do not hesitate to get in touch with our friendly team by calling 866-272-6773. We look forward to hearing from you!